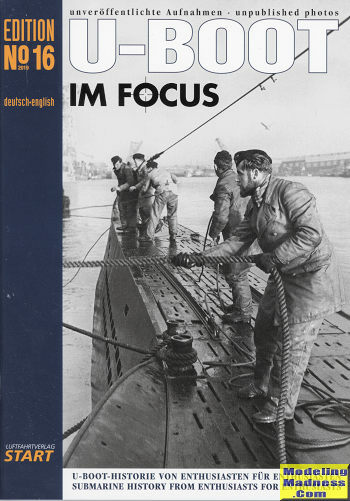 After a bit of a delay due to extenuating circumstances the latest edition of U-boot im Focus has arrived. This periodical has turned into a favorite as much because it has great photos and great stories as anything. The publishers go to great length not only to properly research each article, but also to provide quality, never before published images. As sometimes happens, full information on a subject is difficult to find, but each edition starts off with an errata section that provides additional information on previous issues. Much of this comes from readers who have relatives who served and have passed down their experiences. #16 is a bit different from those that have gone before. Normally there are a couple of fairly long and comprehensive articles with a number of much shorter ones. This volume concentrates on the U481, which operated in the Baltic and from Finland. This is thanks to a large influx of images resulting from an earlier article on this boat. We also are provided a nice color photo of a captured Italian submarine after the Italian armistice with the Allies. We are also treated to a very nice article on the U-393, which spent its career as a training and development submarine for this systems used on the Type XXI boats. In addition there are some sorter articles on boat markings and a very interesting one on the U-993, the only extant Type VII boat. In all, another superb edition. If you are a fan of submarines in general and U-boats in particular, you should be getting this. Review book courtesy of Luftfahrtverlag-Start where you can order your copy and get up to date information on costs.